JOMHosting Review 2019: Is JOMHosting a Good Hosting? JOMHosting.NET offers shared hosting services suitable for webmasters of all skill levels. However, their support is substandard, and their services lack a few advanced features you’ll find with other providers. The Malaysia-based JOMHosting.NET started their operations in 2007 as a small-scale hosting provider. Since then, they’ve grown to become a robust company offering a wide variety of shared hosting, dedicated server, and cloud computing services. They have over 10,000 clients and pride themselves as being a “one-stop shop” for your web hosting needs. They are a solid choice for beginners, but take note that their support is substandard. You’ll also enjoy some of the following value-added features regardless of which plan you sign up for. While all PHP versions from 5 to 7 are supported, I would’ve liked to see more support offered for Python, Ruby, Curl, and other scripting languages. Another thing I don’t like is that SSL certificates are not included for free. However, their entry-level Comodo certificates are relatively inexpensive and more affordable than certificates from other providers. This host is perfect for all skill levels. Beginners can use RVsitebuilder to create their website in three steps using over 700 free templates. You also can use the Softaculous auto-installer to install WordPress, Drupal, PrestaShop and hundreds of other scripts on your website. Advanced webmasters can use cPanel and FTP to build their website. The Mini and Web 2GB plans are decent choices for single domain hosting, provided you don’t need massive database support. With the Web 5GB and Web 10GB plans, the amount of storage relative to the number of domains you can host is a bit lacking for my tastes. Features-wise, your best option is the Promo Hosting plan, but note that you’re going to pay for three years’ worth of hosting up front. However, you do get a free .com domain for three years with the plan, so it’s very affordable if you’re willing to commit for that length of time. Overall, this provider offers very affordable hosting, but you must pay for at least one year’s worth of hosting. Support for JOMHosting.NET is very substandard. Your only options are email support and a very limited knowledgebase. While the hosting may be cheap, it appears to come at the expense of support. For basic to intermediate webmasters, JOMHosting.NET is a viable option. Their Promo Hosting plan offers solid value with a free .com domain for three years. However, certain users may become frustrated with the lack of support. 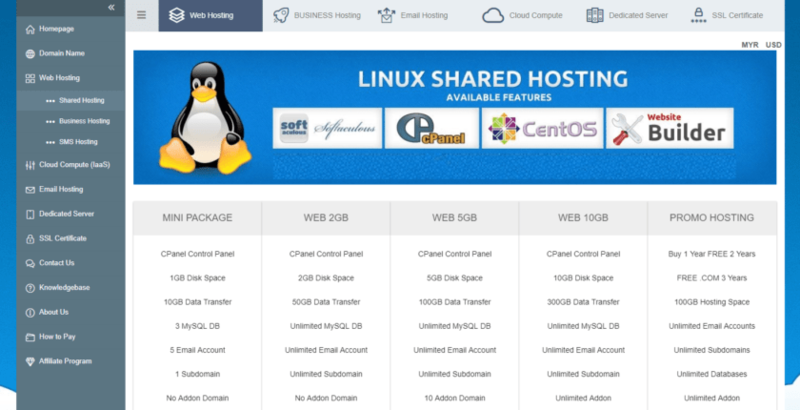 Wondering how JOMHosting stacks up against other Web Hosting companies? Enter any other Web Hosting company and we will give you a side-by-side comparison.